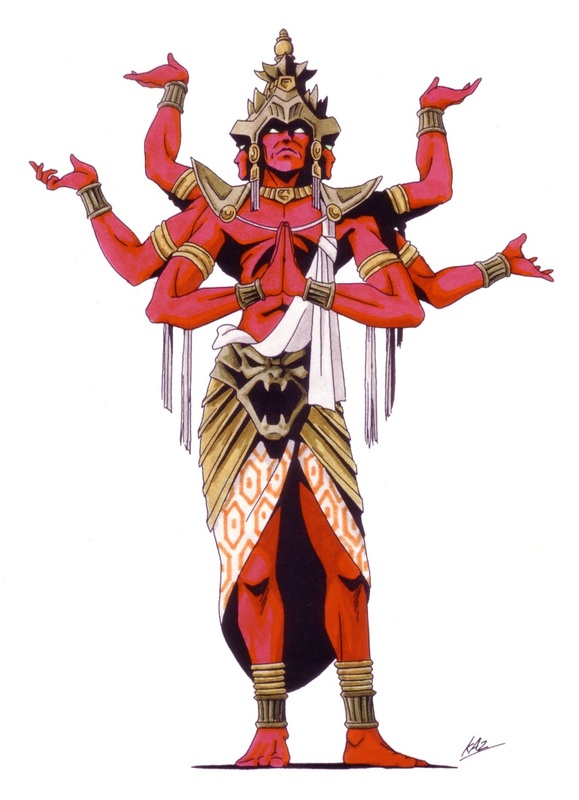 Asura-Oh, from Shin Megami Tensei. Probably based on the Japanese Buddhist depiction of Asura. Asura is a figure of intruige in my opinion. He is a strong and powerful. A bright and brilliant god, yet also associated with dark, demonic forces. A fierce god, a god of war. In Indian myth, they are considered power-seeking deities who exist alongside the devas, the gods in heaven. They are often considered materialistic nature-beings. 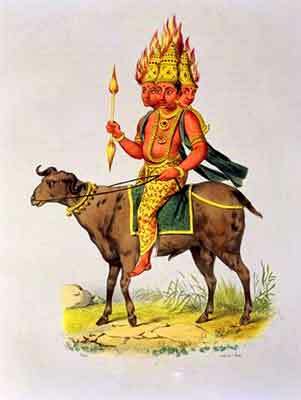 The term first appeared in Vedic religious literature, in which asura was mainly a title for various gods. It means “mighty”, or “powerful”. Many Vedic gods were described as asura, and have been ascribed that epithet many times, such as Indra, Agni, Varuna, Mitra, and Rudra. This epithet, and its variants (such as asurya, meaning “strength”), indicate the strength and power of gods. Indian art of an Asura or Rakshasa. Unfortunately, when Hinduism began interacting with Islam and Christianity, through the Muslim invasions and British conquests respectively, Hinduism became something more black and white, and Asura became demon. While in the lands of Persia (a.k.a. Iran), where Zoroastrianism was prevalent, asura become “ahura”, and refers to three entities: Ahura Mazda, Mithra, and Apam Napat. Ahura Mazda’s name comes from “asura medhira” which was a title given to the Vedic god Varuna, thus Ahura Mazda’s link with Varuna. I’ve heard that Ashura was also the name of a sun goddess from somewhere who was feared for bringing droughts. 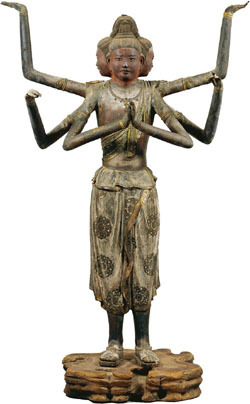 A statue of Asura in Japanese Buddhism. In Buddhism, they are gods of war, and quarrelsome demigods who always fight with the devas. The Japanese seem to have fleshed out Asura’s warrior characteristics and fierce expression. Fitting when you consider that in Japan, Asura is also a guardian. Then we have the game, Asura’s Wrath, which heavily incorporates and fleshes out the Hindu and Buddhist themes it was inspired from. Asura here is shown as a being of potentially infinite strength, someone who won’t back down from a fight. The game itself is also awesome. I consider Asura a god of war, light (like the sun), fire (Ahura Mazda was also associated with fire), power, and dark forces (in reference to its demonic status in Hinduism). Not a demon, not a demigod, but a fierce war god who is both light and dark. A symbol of power, maybe even the power we could potentially have.